Raw beetroot hummus…if you thought hummus couldn’t possibly be improved, think again. That might offend you if you’re a hummus addict like me (I could seriously eat a whole Sabra container in one sitting) but hear me out. This hummus still has that classic Mediterranean flavor that we all love but it’s pink! Hot pink! Not only do the beets give this hummus a vibrant pink color, they actually add even more nutrients to this already healthy dip! All without sacrificing the flavor. Raw beet hummus is actually incredibly simple to make. Just add all the ingredients to your favorite food processor or blender, and combine until smooth and creamy. I used my blender because it has a larger container but a food processor will work just fine. If you use a food processor you may need to halve the recipe or work in batches. Did I mention how beautifully pink this hummus is? The more beets you add, the more vibrant and pink your hummus will be. The beautiful color makes it the perfect hummus for Mediterranean inspired budda bowls! One beet gives a light pink color and no noticeable beet flavor, while two beets gives a hot pink color and adds a slightly sweet earthiness to the hummus! If your blender or processor is having trouble creating the right texture, add in olive oil one tablespoon at a time until smooth. This pink hummus is perfect for adding color to your dishes, dipping falafel and veggies, or even spreading on toast! Yup Avocado Beet Hummus Toast is definitely a thing. If you make this raw beet hummus don’t forget to take photos of your beautiful creations and tag me in them on instagram! If you can’t get enough beets then check out this energizing beet juice with watermelon! 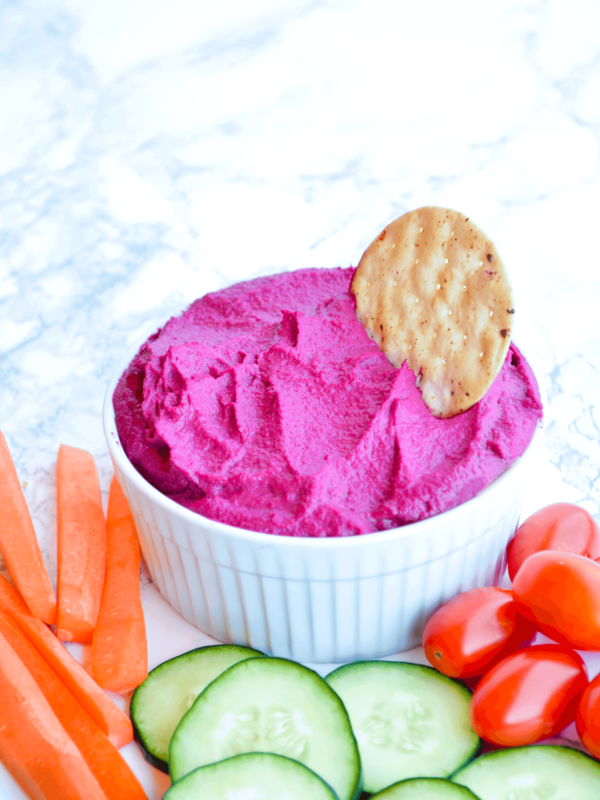 This Raw Beet Hummus has a classic and addictive hummus flavor but with a vibrant pink hue! Perfect as a dip or spread to add life and color to your dish!